Alvaro Bautista will replace injured Ducati rider Jorge Lorenzo at the Australian MotoGP next weekend. Lorenzo did not race in the Japanese MotoGP on Sunday due to a fractured wrist, which he sustained in Thailand. Three-time MotoGP world champion Lorenzo will miss a third consecutive round at Phillip Island after flying home for treatment, but hopes to return in Malaysia next month. Angel Nieto's Bautista will realise a dream by stepping in for Lorenzo on the back of finishing fifth at Motegi, where Marc Marquez sealed a fifth MotoGP title. 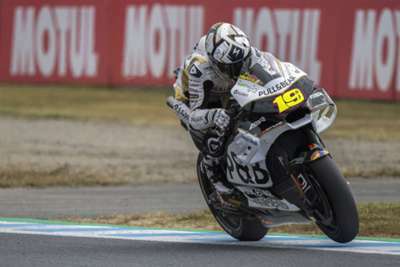 Bautista said: "I want to thank Angel Nieto Team, Jorge Martínez 'Aspar' and all his crew, because they let me compete with the official Ducati team in the Australian GP. I also want to thank Ducati for the opportunity to work with them in their box. "It will be a weekend in which I will try to learn and work as best I can, with no objective in mind. It is an illusion to be able to compete with a factory, and to do it with Ducati is a dream come true." Bautista is set to switch to World Superbikes with Ducati in 2019 after nine years in MotoGP.